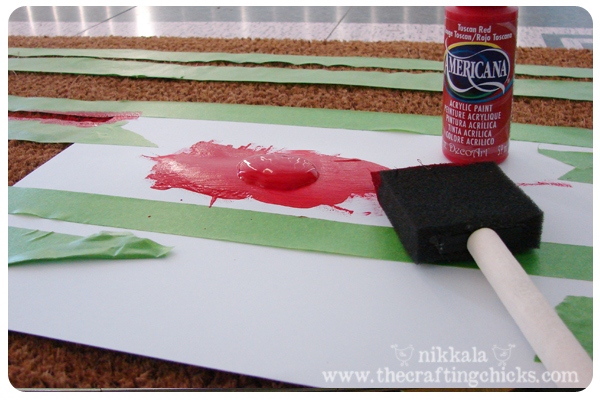 Am I the only one who has a hard time crafting up a gift for dads? Seriously, I love to give a handmade gift–but also try to give something they’ll like and those two don’t always go together when it comes to dads. They’re not really into the cutesy stuff like moms are. 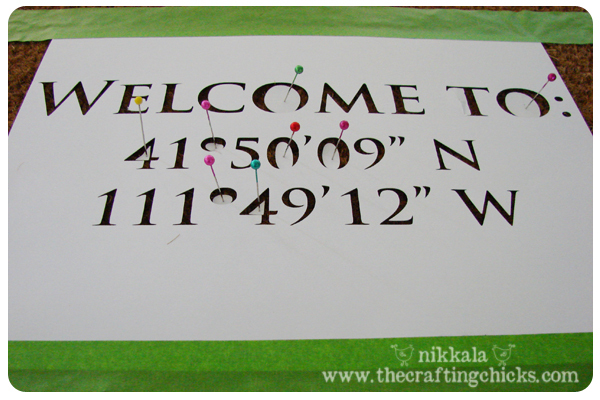 It’s not very often my husband gets excited about using supplies from my craft room! So I knew this was a success when I suggested it as a Christmas gift for my husband’s boss, and the husband was on board. And then he made more to give to co-workers and his dad. 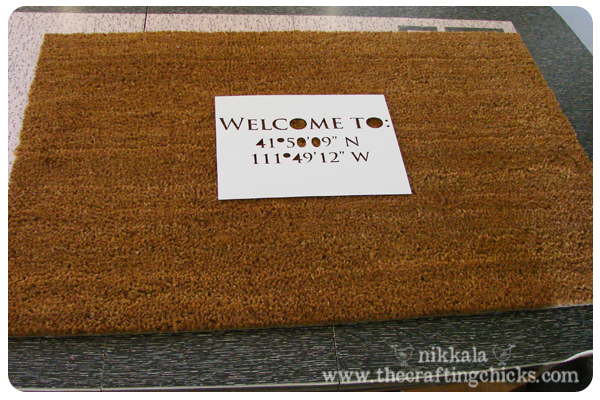 It’s a welcome mat, but instead of putting an initial or last name it uses the GPS coordinates to the front door. To find the GPS coordinates you can either sneak up to their doorstep with a GPS unit, or using Google Earth you can locate the house and the front door to get the coordinates. This is probably the fastest way. 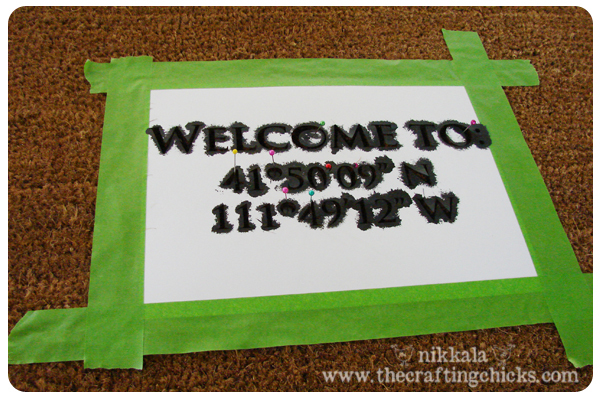 We measure to make sure we’ve found the middle of the rug and then tape it down. And after trying all sorts of things to attached the middles of the O’s and such we’ve found that straight pins really work the best to keep things in place. Then go ahead and paint. You could stop here, but I decided to add some red stripes since this one was for our doorstep. I marked it off with more painters tape and painted red. It looks a lot like a flag. 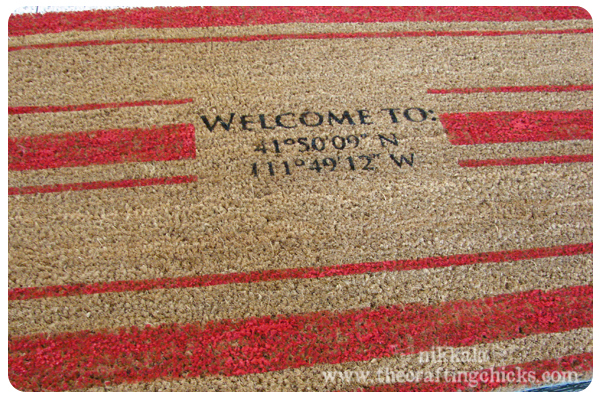 Guess I could have added stars in the big stripes and called it our Americana rug! A simple gift that any geek will love! And use! Do you have geeks in your life? That is so Geeky and PERFECT! Love the idea of stenciling in the design…especially, in this case, the home’s coordinates. So cool! What an ingenious idea! It is not at all geeky. I think it’s wonderfully creative. So much, in fact, I’m going to pin it. 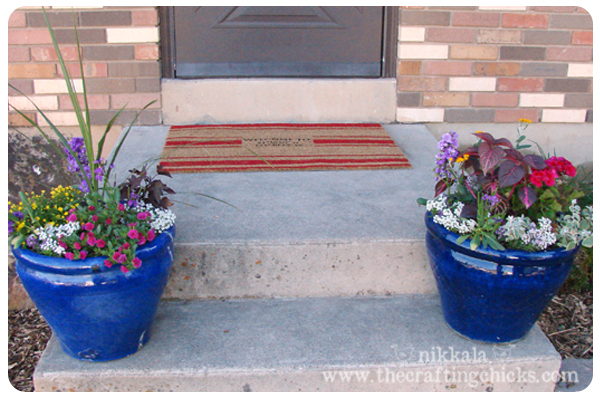 What kind of paint did you use for outdoors? Brad liked this. When I made him guess who he thought it might be that came up with it of our friends he said Chod first thing!! !